To help websites prevent spam and abuse from bots, reCAPTCHA is provided for free by Google. The ability to analyze and distinguish accesses by bots from humans, reCAPTCHA keeps automated software from harming your site. Whereas, valid users can still go through this shield. Working automatically on your site, Google reCAPTCHA is beyond spam and abuse protection. According to Google, that CAPTCHAs are solved helps digitize text, annotate images, and build machine learning datasets. And this will help a lot in book preservation, maps improvement and solve AI problems. 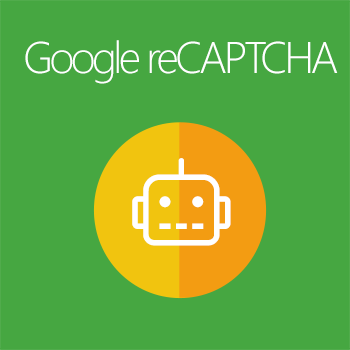 Google reCAPTCHA is typically a checkbox which has to be clicked on to verify if the user is a human or a bot. By hitting the checkbox, the user will either pass through immediately or be asked to do a task to prove that he/she is not a bot. Unlike reCAPTCHA, the user is not required to click on a checkbox to be validated. Invisible reCAPTCHA automatically analyzes and only appears when it doubts the existence of bots. 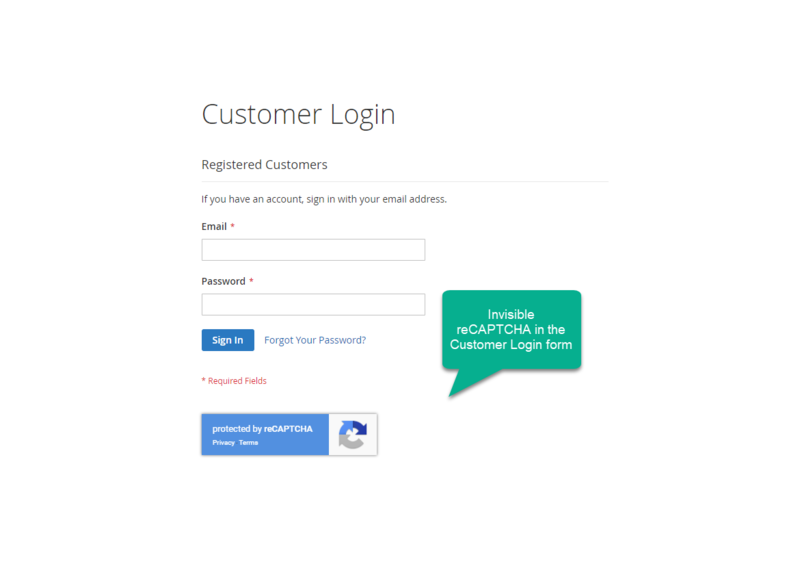 Hence, invisible reCAPTCHA will never interrupt the user and give no negative impacts on conversion rates. Your users do not get annoyed by being challenged to validate themselves. 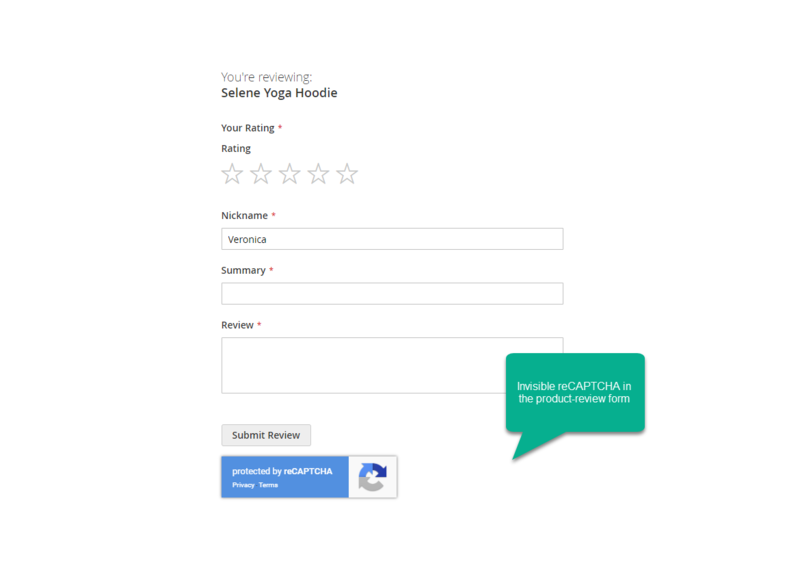 Google reCAPTCHA extension for Magento 2 implements invisible CAPTCHAs to enhance user experience. Your users can pass through the protective shield without being interrupted while abusive activities from bots will be prevented. This outstanding feature helps eliminate site abandonment rate as users may feel annoyed to be challenged continuously by Google reCAPTCHA. 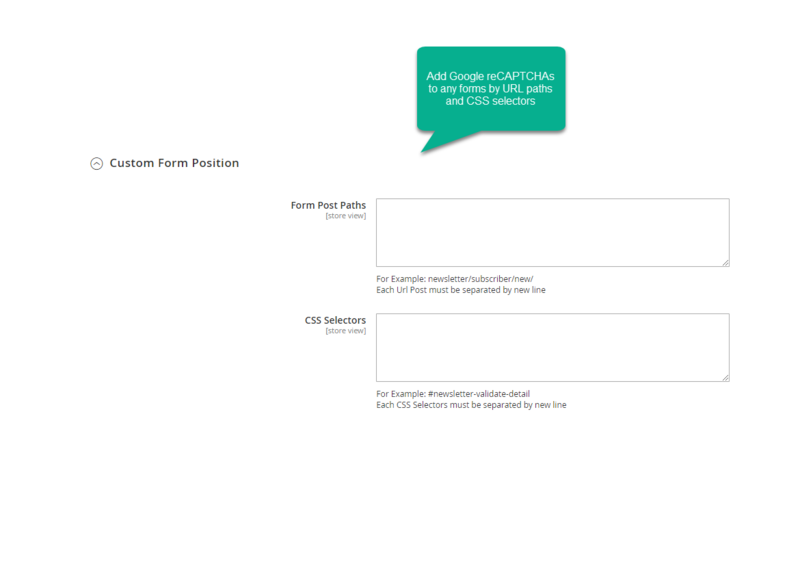 This creates a more user-friendly environment for visitors to keep up with form fulfillment. 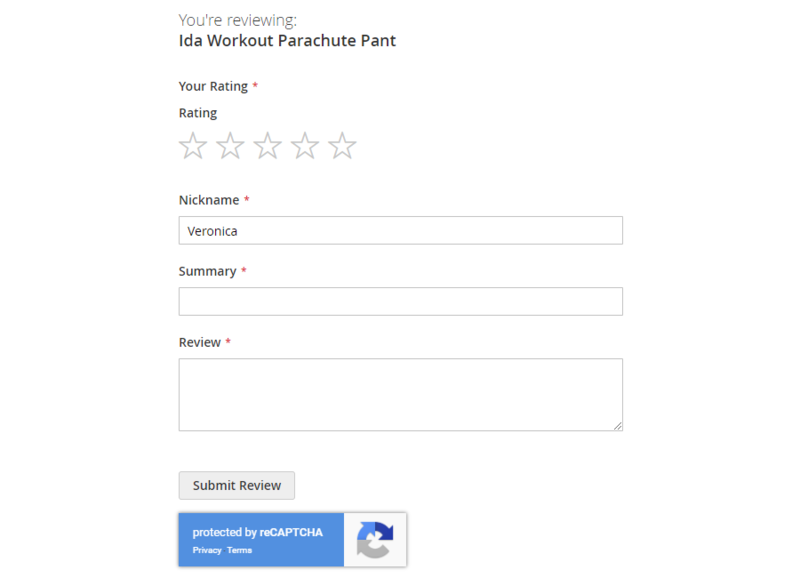 Product review: prevents accesses from bots which go to product pages to review. Blog: stop spamming comments in blog posts. 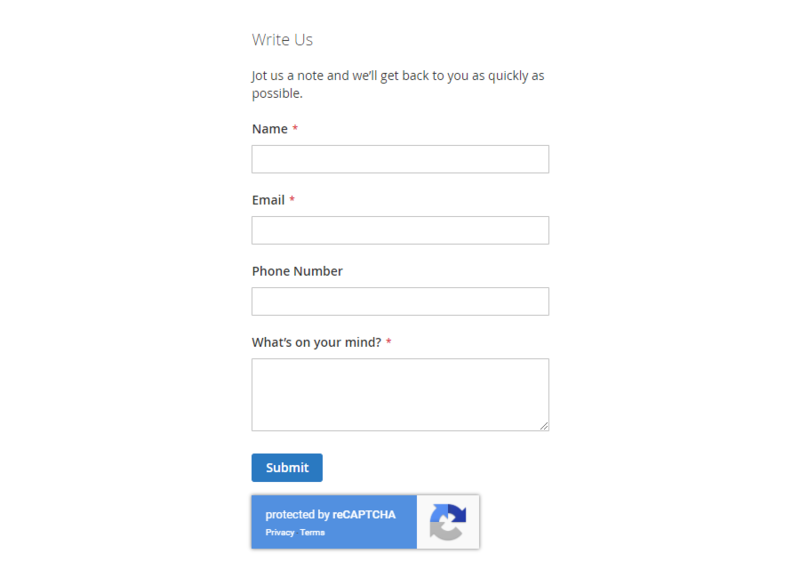 FAQ: Add invisible reCAPTCHA to ask question form. 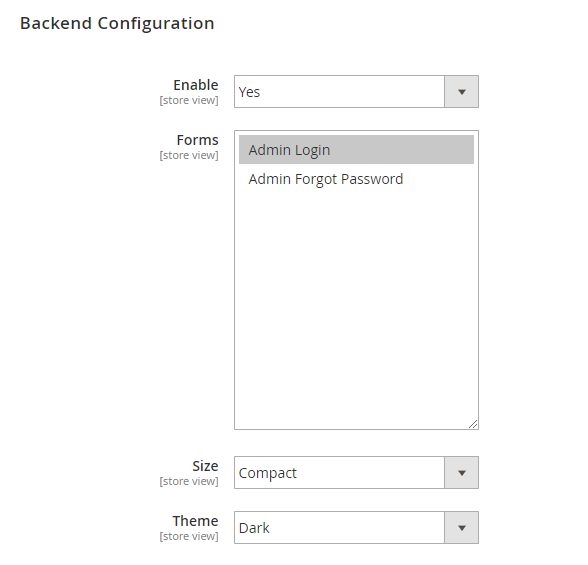 Any forms in Magento, just add configuration options in backend. Learn more. 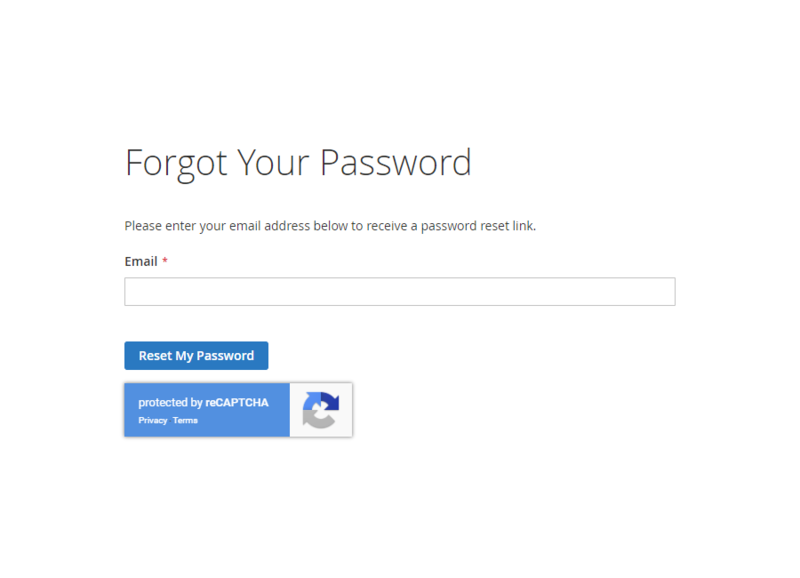 Admin Forgot Password: when a store admin forgets the password and needs to reset it, Google reCAPTCHA will be activate to validate the request. 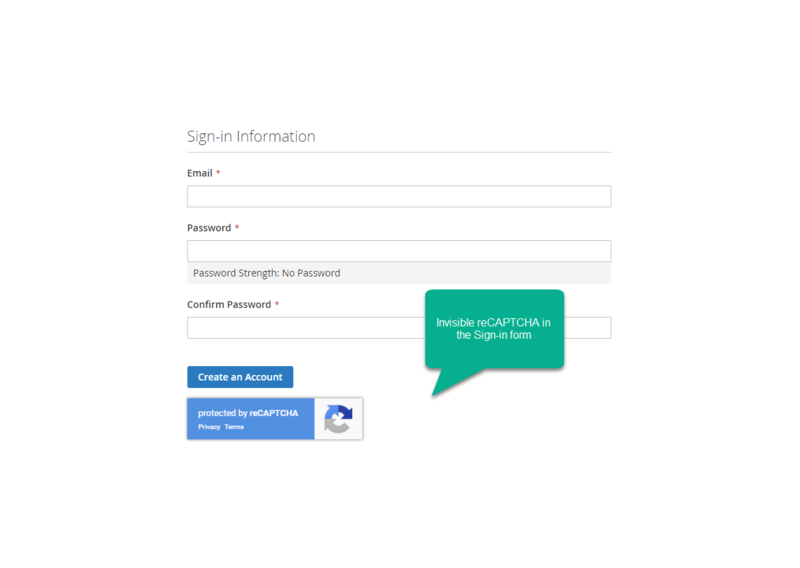 By using URL paths or CSS selectors, store admins can add Google reCAPTCHA to any kinds of forms on the frontend. 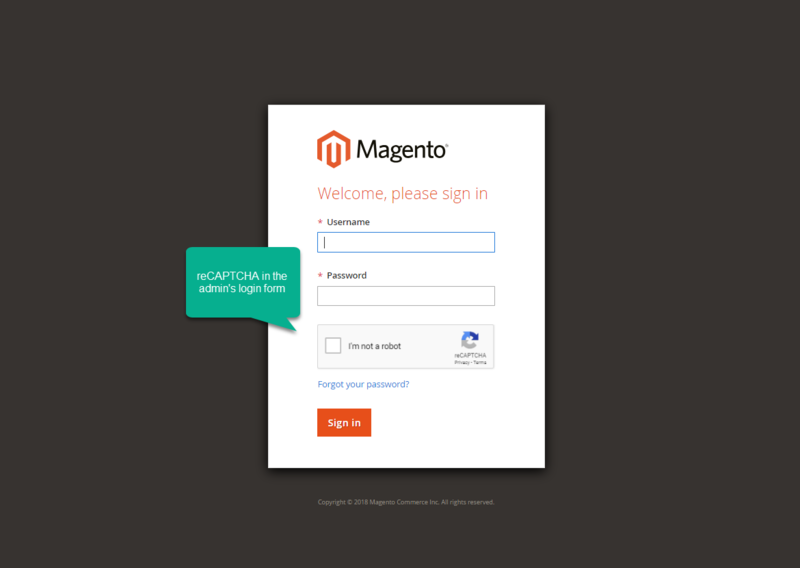 Google reCAPTCHA for Magento 2 is highly compatible with Mageplaza extensions: Blog, Security, Social Login, Gift Card, One Step Checkout . Display reCAPTCHA in multiple positions on a page such as: inline reCAPTCHA, on the right bottom or on the left bottom of the page. 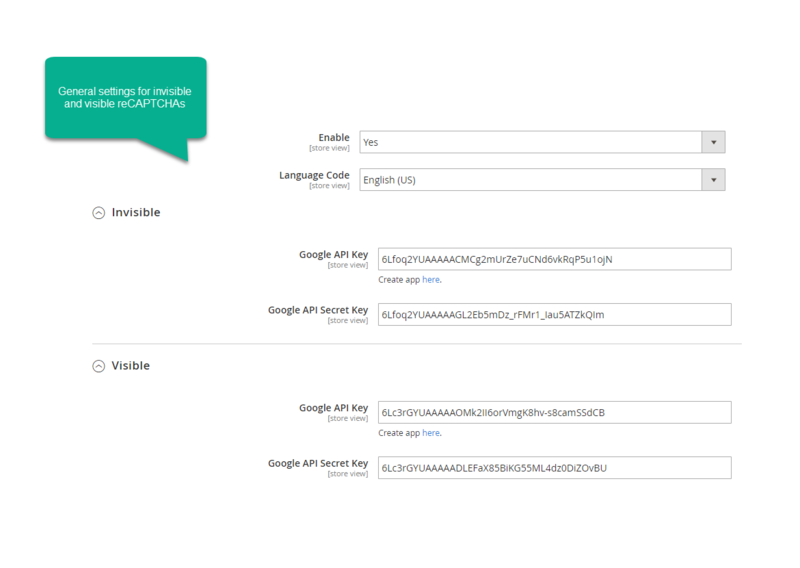 Admins can select a language code to define which language to be used in the Google reCAPTCHA form. 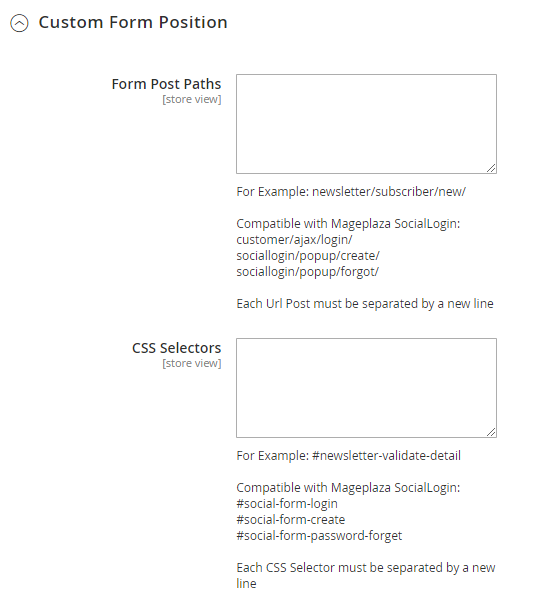 Compatible with Mageplaza extensions: Blog, Security, Social Login, Gift Card, OneStepCheckout. filter_drama To which forms can I implement Google reCAPTCHA? You can definitely add CAPTCHAs to any forms that you want. 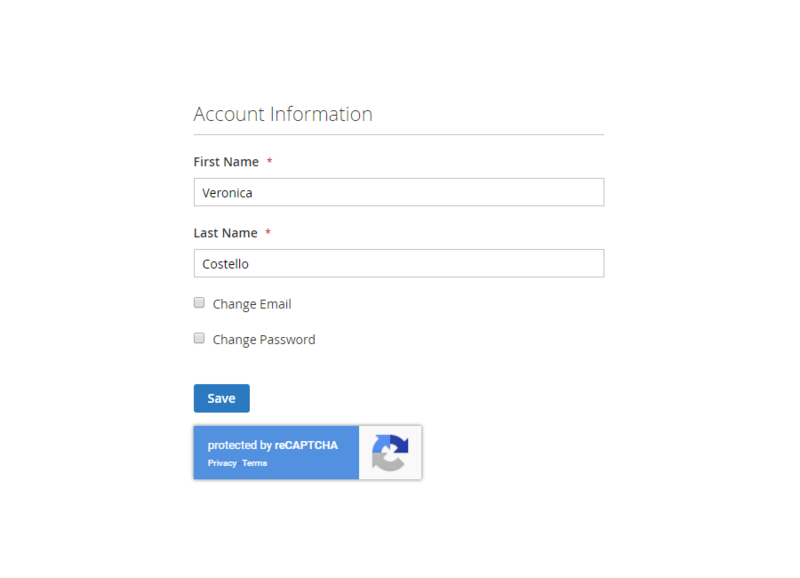 You can only fill correct and enough information in the backend settings to use reCAPTCHA. 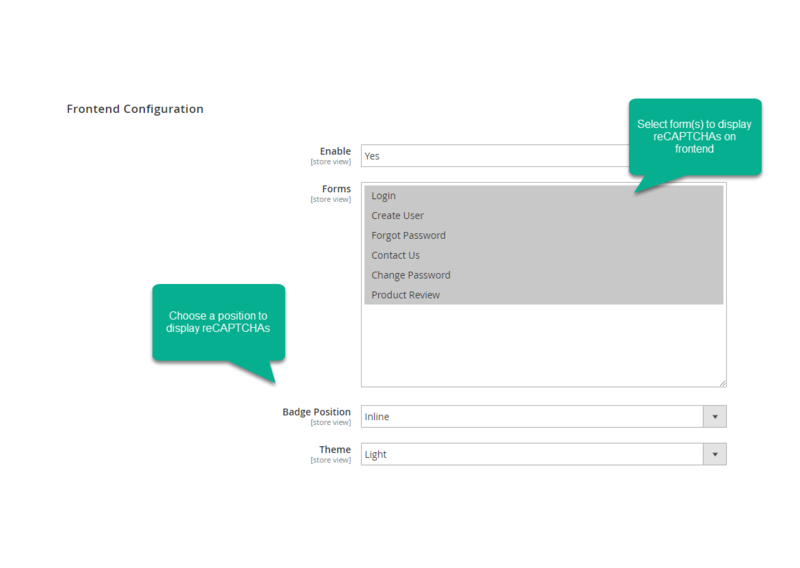 filter_drama Which type of Google reCAPTCHA is applied on your module? filter_drama Can I choose the position to display reCAPTCHA? In our recent configuration, Google reCAPTCHA extension is supported to appear at three different positions which are Bottom left, Bottom right and Inline. filter_drama I want to select a language to display reCAPTCHA, is this feature available in your extension? To suit every single language of each nation, Magento 2 Google reCAPTCHA supports you in choosing languages on backend. This extension is very good and easy to use and This is truly an impressive extension to kick spam out of the store. Thank you for your input to the development of great extensions. Thank you Mageplaza! Thanks for this extension. It works as expected and this is great! Spam registrations have stopped. No more reading and guess for the login to the backend. I had a question and the support has answered fast, friendly and helpful. Thanks! Very useful extension and free extension. Google re-captcha helped me reduce it to zero. Simple yet useful. Works perfectly without any issues. It works very well with my Magento 2. I recommended it to everyone. Thanks for the free extension. EXELLENT extension and entirely free extension. Google re-captcha helped me reduce it to zero. Simple yet useful. Works perfectly without any issues. It works very fine with my Magento 2. Very useful extension, recommended for everyone. I'm not sure why this isn't part of Magento2 core, but every site needs this plugin. Google's reCAPTCHA is essential to preventing most bots from attacking your site. 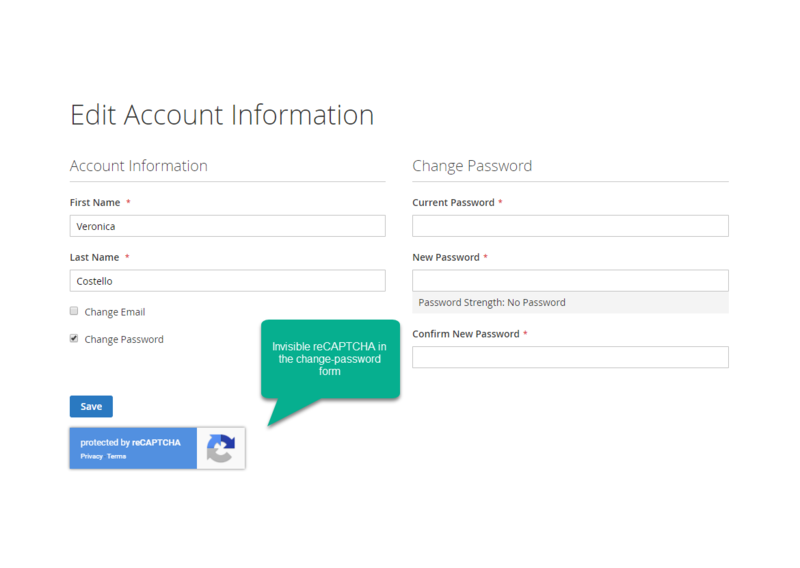 Provides ability to integrate Google reCAPTCHA to prevent fraud from contact & account pages wherever you want to enhance security concerns. 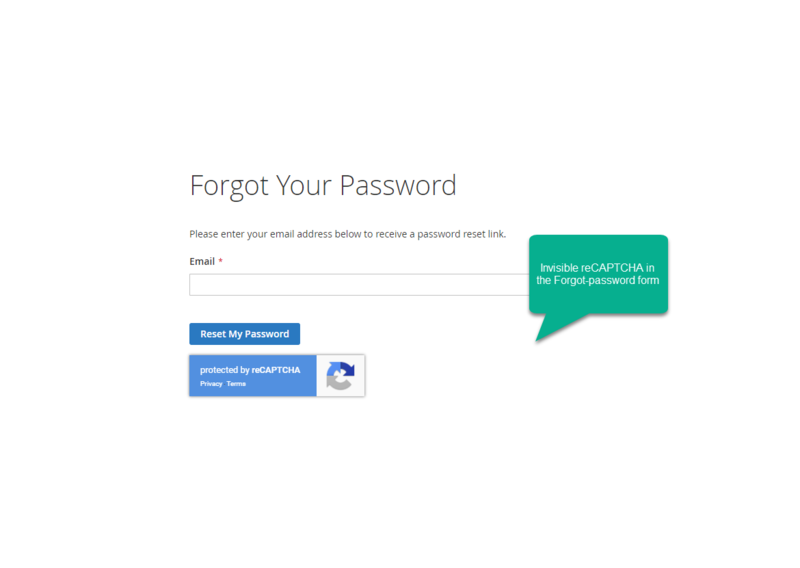 Mageplaza Google ReCaptcha does the job for you. 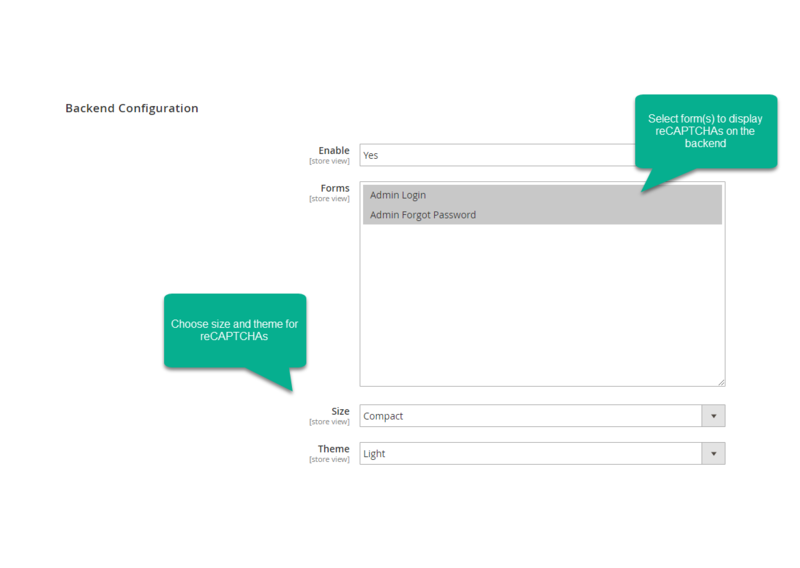 Simple to configure install, this module has solved the spam registration. Fast setup. I recommend this extension to avoid span users registrations orders. I have struggled for a few months keeping hackers at bay with client setup. Tried all sorts and rather than implementing Google reCaptcha myself used this extension. It has now been in for 24 hours and absolutely no more hacked clients being set up - easy to install, but like a few comments would have been even easier if the core was part of the package installed:-) Perfect anyway and a life saver. Very useful. Other CAPTCHAs are not enough to stop Russian spammers but this has solved my problems. All with easy installation and free, what else can I ask for. This extension deserves a 5-star rate since it works great and it's free. And it really helps a lot of customers or developers build their webshops. It should be implemented in Magento 2 core by default since the extension is essential. I found the extension useful to protect my store. The extension is easy to install, easy to configure and in addition, you can count on responsive and competent support. To be recommended without hesitation, with your eyes closed! It is an amazing extension! It helps greatly in the work of the store. Besides, it works with different forms on different pages. By default, the system requires the module core to be installed. Before installing it we got lots of spam from Russian fake accounts registration, even if was active standard Magento2 reCaptcha. Installing this module has solved the spam registration. Easy installation and fast setup. I can recommend this extension. I use it instead of internal Magento option. Looks very good and easy to use. I recommend it for everyone. Good job guy's! Look forward to more useful tools. 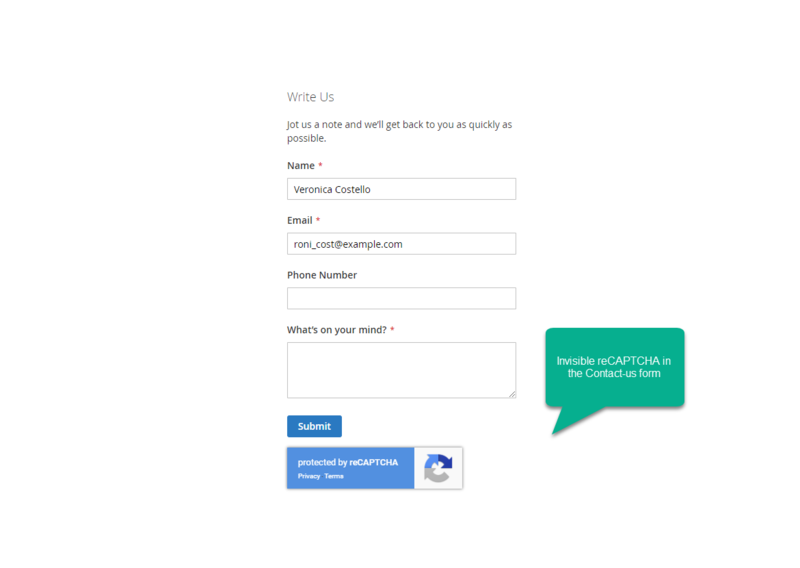 Currently using the invisible reCaptcha on the contact form. Installation was easy. I really like how it's simple to add on to other existing forms like login, forgot password, admin forms and even any custom forms you might have. I did have a question on the product and customer support responded with the answer that same day. A very good module this should be a part of the Magento 2 Core, it prevents spam bots that were previously plaguing our online stores. Easy to install and configure. Easy installation, the module is working exactly as described. After the installation, I forgot about the problems I used to have with the Spam. A good module, it should be in default of Magento 2 Core, to be honest. Easy installation, the module is working exactly as intended. What we needed to stop the bots and spam and a freebie, what else can you ask for? Thank you. Very easy to install and configure. The site is still in build mode though so I can't comment on what it has stopped. However, I would say that based on my personal experience, the extension is essential. Faced some conflicts at the time of implementation, but after installation, it is working smoothly. Everything is handled by itself as it should. At first, it had a minor conflict with my marketplace extension and Mageplaza support team helped me to fix it in a very short time. Even though the extension is free, they provide great support for it. 100% I recommend. Hey, this is unfair. I was searching how to secure newsletter subscription and released only lately I had already installed a solution with your module!! Any other solutions were related to custom modules, rewriting a theme and so on. With your module, it is simply as coping two lines in a field at the backend! It's a really very good extension and working on our store well. 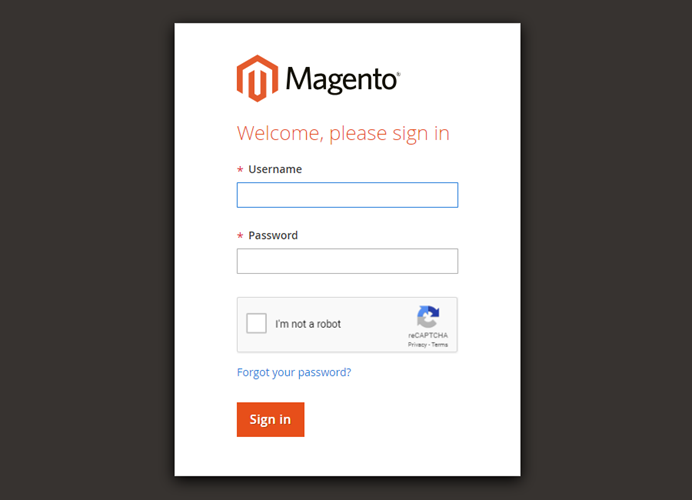 We can use it easily and it works properly for Magento 2. It is an amazing extension. It works without any errors. Also, it includes wide functionalities and also is convenient as well. Thanks! Few days, I installed this extension on my Magento 2.2 site and it is working properly than Magento native one. 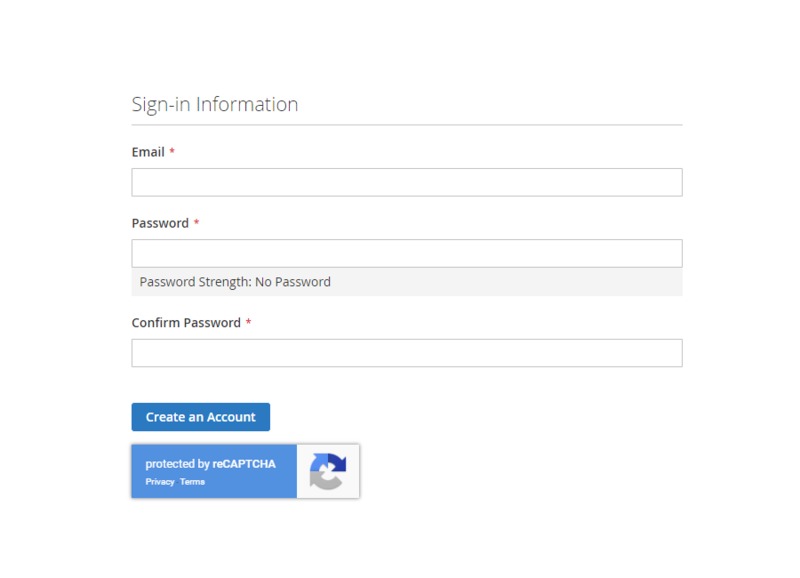 The extension allows you to ReCaptcha 2 wit invisible reCaptcha. It's a nice extension and I recommended to anyone who uses Magento as an eCommerce platform. No more spam in my inbox! This extension has successfully resolved spam issues on my shop. 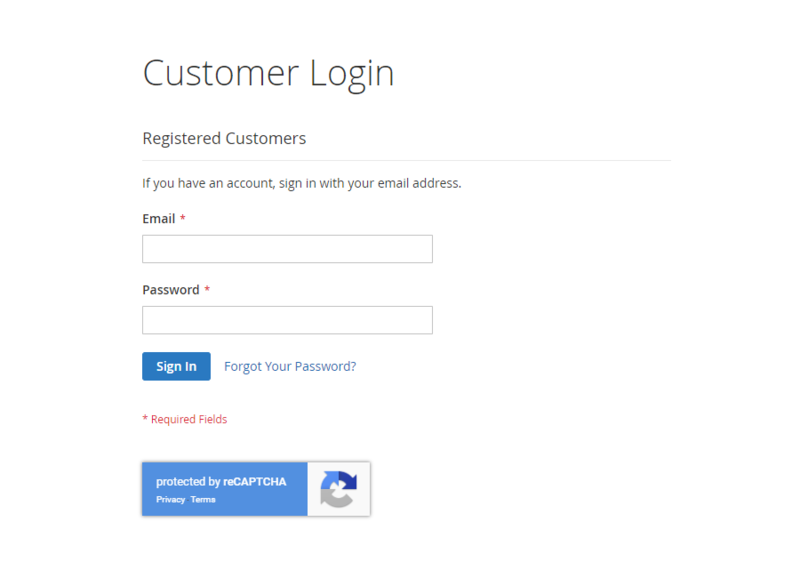 It is so easy to install and set up even for custom forms. Big thanks to Mageplaza team! It is the best extension and easy to integrate with Magento store. Thanks to Mageplaza solving our requirements time to time. The best part is, it has a list of modules pages on which you want to use it. 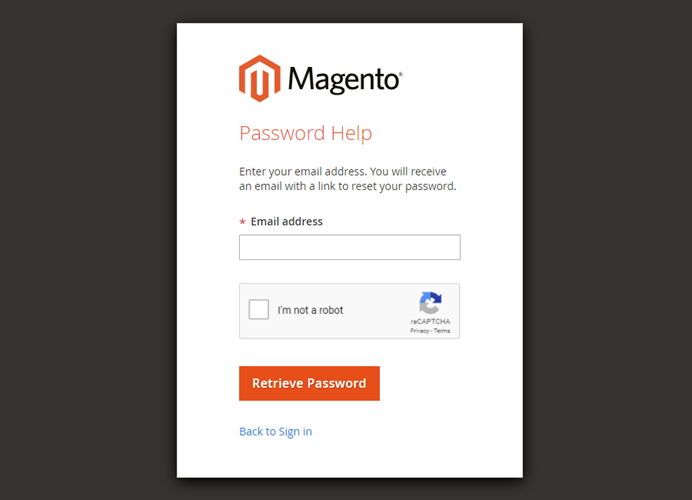 It is so easy to implement on the site and Captcha can easily be applied on the important forms on Magento platform through its admin control and it has completely stopped spam emails which caused a lot of problems. Thanks! I was getting thousands of spam customer registering my website which is resulted in slowing down the website. 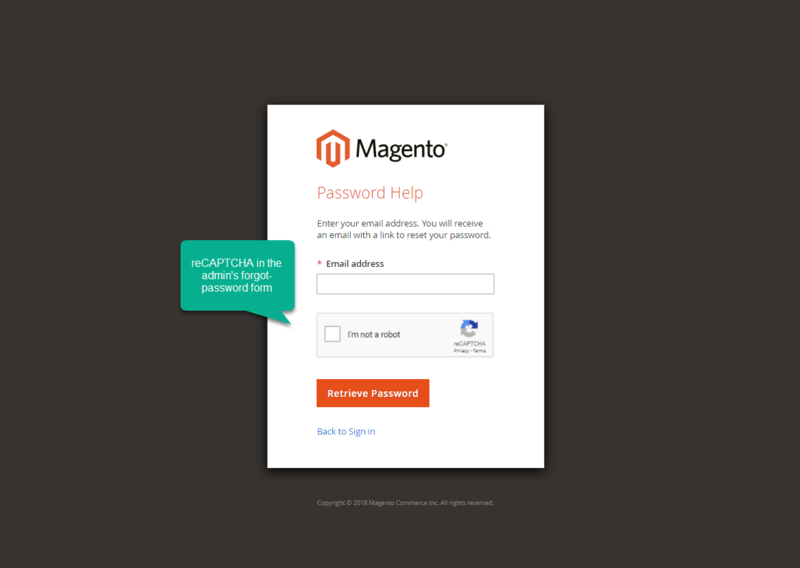 I have installed Mageplaza Google reCaptcha Magento 2 extension and it was the end of spam attacks. At first, it had a minor conflict with my marketplace extension and Mageplaza support team helped me to fix it in a very short time. Even though the extension is free, they provide a great support for it. 100% I recommend. Everything is done as it should. It works without problems on the principle of "set and forget." There's no conflicts. Also, unlike many other vendors, Google reCaptcha is totally free. It is so nice. If you need a similar extension, you can download and install. I recommend. The extension is so nice, but if they also provide visible captcha for frontend as well then it will be great. But the overall extension is working as expected. It didn't conflict with any of my extension, so for me, this's a great plus. It is an amazing extension. It works without any errors. It includes wide functionalities and also is convenient. I recommend everyone to install. Now it helps in the work of the store. This module works with different forms on different pages. Please don't worry as I checked for Magento community 2.2.6. Google reCaptcha extension is very good and easy to use. It has helped a lot with my site. I can work well in every form you have created for a website. Also, Mageplaza_Core module must be also installed before using this. This is an excellent module for free. 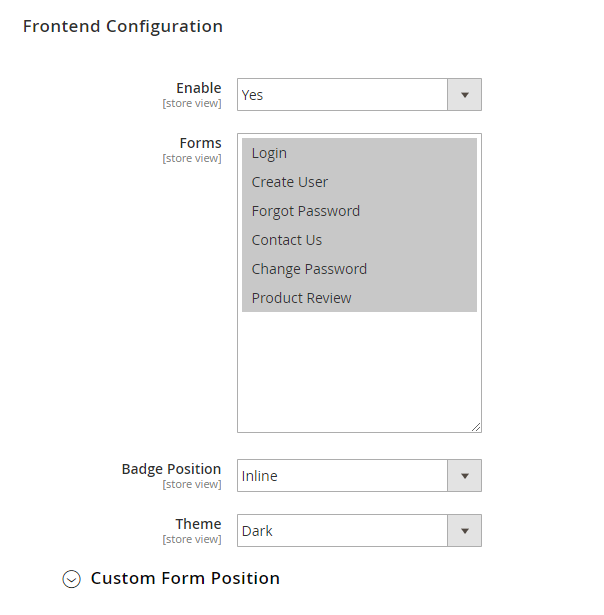 This is a great extension to have for me working out of the box with my Magento2 theme. It didn't conflict with any of my extension, so for me, this's a great plus. It is an amazing extension! It helps greatly in the work of the store. Besides, it works with different forms on the different pages. By the default, the system requires the module core to be installed.